2007 Dagmar Reinhardt: ‘Prosthetic Surface – Strategies for a Dynamic Architecture’, AASA Conference, UTSepress, Sydney 2007/10, ISBN 978-0-9802840-4-1, 978-0-9802840-4-1 (online). The paper investigates strategies of dynamic surface formations in a transfer from fashion to architecture. 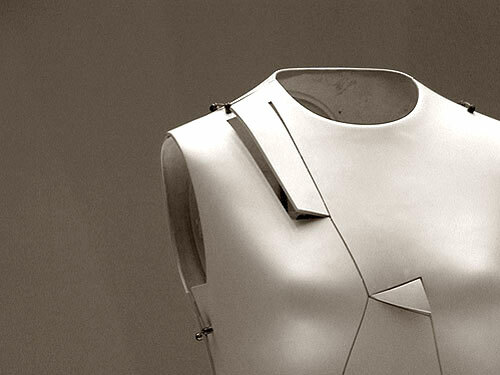 ‘Remote Control Dress’ (Hussein Chalayan), ‘Dress becomes Body (Rei Kawakubo) and ‘A-Poc’ (Issey Miyake) are precedents of specific technologies and techniques that produce responsive, performative, or phenomenal dresses. These garments can deliver generative surface methods for an architecture operated through the user. The paper frames key parameters (cutting scheme, constructive line, programmatic insertions, and operative field) and their respective characteristics and interrelations in analysis. Thus, principles are derived and channeled into performative design models in a media rotation with conversion between digital and analogue modeling. The paper discusses the potential of these dynamic design models in a design process that addresses the change capacities of architecture in shifting cultural and programmatic context.